The PPMA Show returned to the NEC Birmingham to showcase the very latest innovations in the UK processing and packaging industry. The event - a highlight of the UK manufacturing calendar - saw a wealth of the biggest names in the food, chemical and pharmaceutical processing industries come together under one roof, sharing the latest technology and business tips. The Processing and Packaging Machinery Association supports the promotion and expansion of hundreds of manufacturers and suppliers across a variety of industries, as UK businesses small and large look to grow into the UK and export markets. Whilst being a UK trade association, PPMA represents and promotes its members around the world, highlighted by a number of visitors from across Europe, the Americas and the Far East. 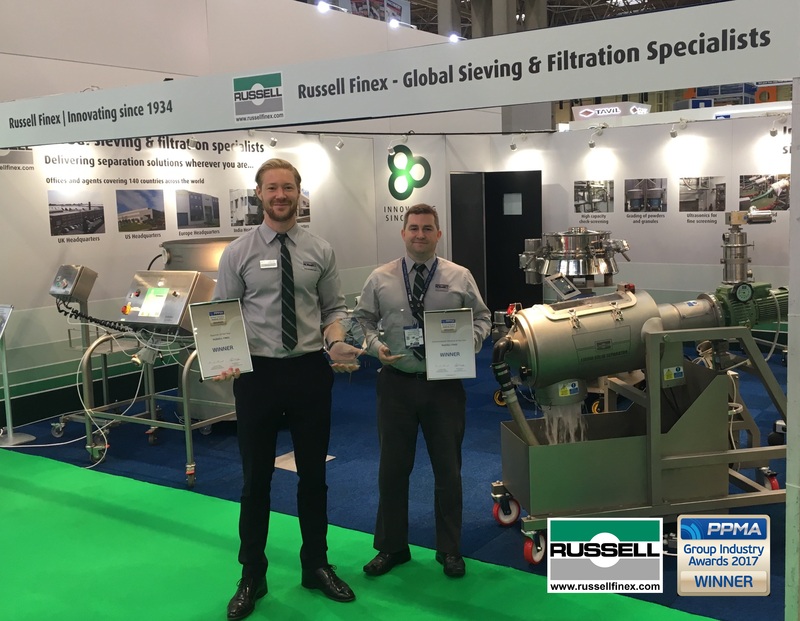 Russell Finex, a global manufacturer of premium sieving and filtration equipment, presented its full range of separation solutions at the PPMA Show. The company also enjoyed success at the PPMA Group Industry Awards, which are held during the exhibition. Having won two awards at last year’s ceremony, Russell Finex once again enjoyed double award success, taking home Exporter of the Year and Environmental Initiative of the Year for 2017. With over 80 years of experience supplying high-quality equipment to food, chemical and pharmaceutical industries, Russell Finex provides a range of versatile separation solutions and customized equipment to a global network of customers. With a UK headquarters and subsidiaries in the U.S.A, Belgium, India and China, the company has a truly global infrastructure, able to support a wealth of industries and territories around the world. A range of industrial separation equipment for wet and dry applications was displayed at the show, with experienced machine experts on hand to provide advice and insight on the most suitable product for specific materials. A highlight was the Finex Separator™, shown with the Russell Screen Changer™ deck lifting device for round vibratory separators, which was awarded PPMA’s Most Innovative Ancillary Equipment in 2016. Also displayed were a range of vibratory screeners, liquid solid separation equipment, and inline liquid filtration systems. To find out more about the full range of separation equipment, contact Russell Finex today.